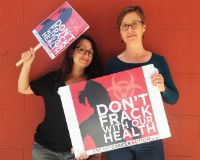 We’ll be heading to Philadelphia this July 24th to join thousands from across the country in calling for an end to fracking and dangerous drilling. We really want you to march with us—and so we wanted to let you know about the buses leaving from a city near you that will be taking activists in your area to the march. Click here for a map and to get your bus ticket to the March for a Clean Energy Revolution today! After you get your ticket, make sure to sign up here to let us know you’re coming so we can get you all the information you’ll need. A strong BCAction presence will speak volumes to the urgent need to end harmful energy sources that use toxic chemicals linked to breast cancer. The Democratic National Convention will be taking place in Philly the week of the march—it’s time to demand our elected officials protect our health! We hope you’ll join us in standing up for women nationwide!